yesterday carrie and i coordinated our wardrobe so that today we'd both be wearing red pants. today was also the first time i commuted to work in my red pants. i didn't bother to see if i was attracting any more attention than usual. maybe i'm just self-conscious, but when i wear red pants i feel like everyone's looking at me, regardless if they are or aren't. i found that the best way to deal with red pants anxiety is to just pretend i'm not wearing them. 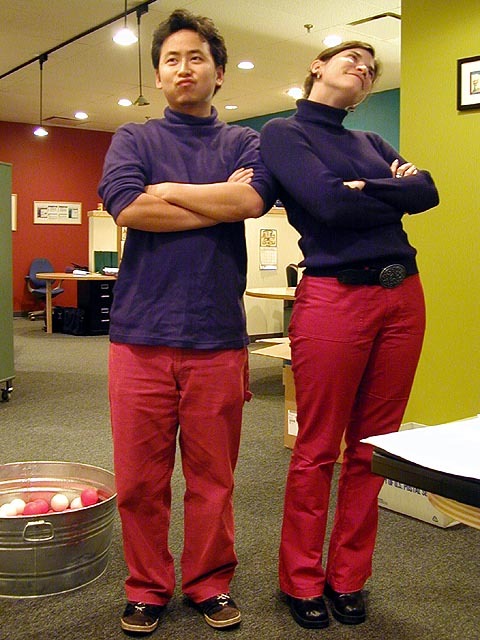 anyway, so carrie and i both wore red pants in the office today. know what? red pants definitely looks better on carrie than it does on me. carrie can pull it off. i'm still struggling. with time, perhaps i will master these pants! item of interest: i coined a new nickname for amanda. her previous nickname was omanda bin laden, but her new nickname is ag friskypants. don't ask! during lunch i was originally suppose to go buy a new t pass in harvard square but instead i went to go see an open house close to the harvard university area behind the divinity school. i got amanda to buy me a t pass while i was away. i went and saw the house and wasn't that impressed with it. i now realize that i like apartments with a maze-like arrangement with lots of different little rooms versus apartments that are more open with bigger spaces. this will be the key factor in my house hunting decision. the places i've seen so far that i've really liked are places that have a lot of rooms arranged in a circular manner. after work i headed to canal street to meet up with julie so we could go to the dixie kitchen and tc's lounge down by the berklee school of music. during the dark, cold, rainy walk down to her office, i suddenly remembered that i didn't have my mbta pass with me. i remembered amanda telling me that carrie had it when they came back with the new passes, and i just forgot to get it back from her. so it looked like a night of old fashion t riding with tokens and quarters for me. our green line journey into the hynes convention center station took forever. there was a conga line of trains in front of us that kept on stopping every few minutes. when we finally got out, i felt motion sick and was happy to be breathing some fresh air again. i might want to reconsider living in the brookline area if i have to deal with the green line all the time. the best line by far is still the red line. when we got to the dixie kitchen, david cronin was already waiting by the street corner. we'd find out soon enough that the dixie kitchen was closed, quite possibly for good. we wandered around the area and opted for the pad thai cafe. i had the goi see me, which according to the menu is a "fried, yellow, egg crispy noodles with shrimp, chicken, onions, mushrooms, carrots, bamboo shoots, and scallions in gravy sauce." for $5.95, it was an okay meal. david had the chicken fried rice, julie had the tom yum soup with some spring rolls. when we were done eating, we walked over to tc's lounge. dave: ...and girls want everything else! tc's lounge is like a nostalgia/sports bar. the atmosphere was super relaxed, and posters and photos and other bits and pieces of nostalgia covered the walls and ceiling. the place reminded me at times of an amusement park, of las vegas, and of a museum. julie, david, and i were the first ones to arrive, but soon people started trickling in. the roster (besides ourselves): roy, chris m., dave's friend chris, chris gervasi and a friend of his (forgot his name), tara and jessica (from cci), tunde, elias and amanda. klea was originally suppose to be there but she called to cancel. special julie lepage tc's lounge mini-gallery! very briefly, some highlights from tonight: i found out chris actually knows turkish and is currently taking mandarin chinese at the harvard extension school (he finds the grammar hard, which is surprising, because i think the grammar is the easiest part about chinese), in preparation for some potential anthropological work in western china perhaps in the near or distant future; the big scandal that all the cci ladies were talking about was the discovery that elias actually has a girlfriend; dropping julie's brand new g1 digital camera onto the table (i'm so sorry julie! ); i spent some considerable minutes drawing some bad maps for julie and david so they can find suishiya tomorrow in chinatown for korean box lunch specials; julie showed us how there was a perfume vending machine in the women's room (put in 10 cents and it sprays you from the machine) while in the men's bathroom all we had was a condom machine; the naked poster of marilyn monroe; the "oh no you didn't" poster of the yankees; poster of alf; the fake fireplace; jukebox 2 songs/$1; barmen playing shanghai on a coin operated betting machine; my 3 cokes; triangulating digital paparazzis; seeing tunde almost get into a taxi with the cci ladies but at the last minute said good bye and then walking away; riding the number 1 dudley bus with david and julie and getting a transit ticket even though it turned out to be worthless; drunken hotties on the bus and a drunken man's mission to "get to know them better"; julie taking the 77 from harvard square (my station! ); and david's silent good bye wave and then off the bus he went.